Starting activities in 1996, BeyAb Gıda Mühendislik Ürünleri San. Tic. Ltd. Şti. with its expert food and agriculture engineering staff assists flour factories in developping and producing high quality products. 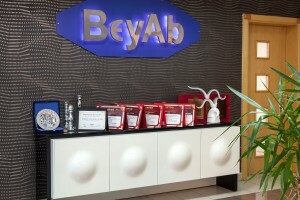 Working in close cooperation with BASF company, world’s most important chemical manufacturer, BeyAb has been formulating and manufacturing its products to solve problems specific to wheat structure and flours both in Turkey as well as in other parts of the world. Not only does BeyAb Gıda deliver highest quality and pure flour additives directly to manufacturers, but also shares its accumulated Know-How related to the application of these pure substances. Improve the poorest flours to a satisfactory level. Increase awareness among the Millers of the growing importance of additives and enzymes in an increasingly competitive economic environment and in constantly boiling world wheat market. We offer to assist you with application of all kinds of pure enzymes. Working with an international enzyme manufacturer of a very wide product range, as BASF is, having enzymes manufactured under its own brand, BeyAb succeeds by changing the formula of additives according to the state of wheat at the beginning of each crop . BeyAb is the reference you can rely on for any question regarding the choice of wheats and production of flour, bread, biscuits and enzymes. Copyright © 2016 BEYAB GIDA MÜHENDISLIK ÜRÜNLERI LTD. ŞTI.